Geopolitical decisions often reflect the aspirations of peoples. The Hamas rulers of Gaza made no secret of their aspirations when they built a secret tunnel from their territory into Israel: to kidnap and kill Jews. But a focus on the physical tunnel itself lends a telling perspective on the self-made hell of these moral monsters. The latest of many tunnels discovered by the Israeli Defense Forces was said to measure a mile and a quarter long, wide enough to bring people easily through it. It was made of concrete, and supplied with electricity and ventilation. And it was to come out near a kibbutz, allowing easy access for the infiltrating murderers to potential victims. My back-of-the-envelope calculation finds that a tunnel of this length, with 8-foot-high and wide walls, dug 100 feet deep, would require about 250,000 square feet of concrete. But what else could that material have been used to build? An elementary school close to where I live is a two-story structure that is about 190 feet square. Such a space could fit 18 decent-sized classrooms, a few administrative offices, and a large rec-room/cafeteria, all with concrete interior walls. Such a school could educate around 1,000 kids at a time. I calculate that such a school would require about 125,000 square feet of concrete. In other words, the 250,000 square feet in the Hamas death tunnel could have built two elementary schools to educate 2,000 children at a time. The Gazans chose their Hamas rulers who reflected the people’s aspirations when they built that tunnel to kill Jewish children. But they’ve no doubt killed many Gazan children as well. You see, one report suggested that at least 160 Palestinian children died as forced laborers building the tunnels that the Israeli Defense Forces discovered and destroyed two years ago. 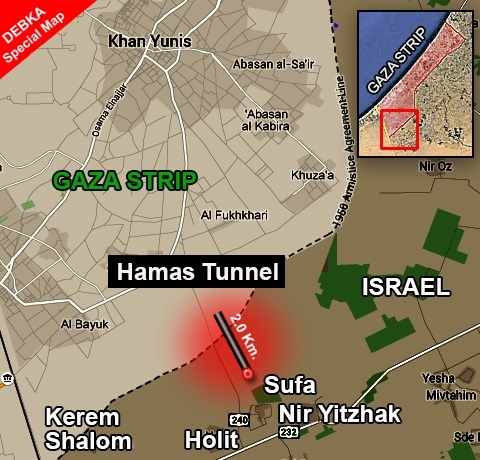 A tunnel-versus-school decision was not put to a vote—nothing is in Gaza. But the aspirations of the Gazans is reflected in this fact: rather than sitting in school rooms to improve their minds in order to improve their young lives, many of those young lives were worked to agonizing deaths to sate the insatiable hatred of parents who would condemn their young children to such a fate. The Nazis used concrete to build gas chambers so they could exterminate six million Jews. 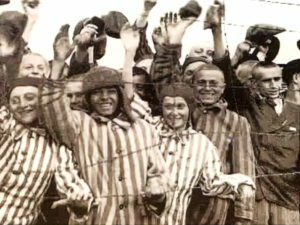 But an aspiration different from that of the Gazans and Nazis came out of the Holocaust. A few days after the Bergen-Belsen death camp was liberated by the Allies in 1945, a visiting journalist recorded an extraordinary event. With bodies of the murder victims still lying unburied, a British chaplain concluded a seder for the weakened, physically wrecked, surviving Jews. They sang the “Hatikva,” the Zionist anthem that became the national anthem of the new state of Israel three years later. Hatikva means “the hope.” Those survivors voiced their aspirations to rebuild their lives and to build a country in which they and their children could live without fear and could achieve the productive goals that should be the aspiration of every individual. During the seven days of Passover, Jews reflect on their liberation from ancient slavery and hope that they might liberate their souls from any hate and anger that might still imprison them. And it is a hope at this season that the hearts and minds of Gazans, Palestinians, and all individuals might aspire to turn to the works of peace and prosperity. For decades the US and Saudi Arabia have shared a peculiar relationship: the Saudis sell relatively cheap oil to the United States for which they accept our fiat currency. They then recycle those paper dollars into the US military-industrial complex through the purchase of billions of dollars worth of military equipment, and the US guarantees the security of the Saudi monarchy. By accepting only dollars for the sale of its oil, the Saudis help the dollar remain the world’s reserve currency. This has meant that we can export inflation, finance the warfare/welfare state, and delay our day of financial reckoning. But it seems this longstanding entangling alliance is coming apart. First, the US nuclear deal with Iran has infuriated the Saudis. They view Iran as bitter rivals and spared no expense in Washington to derail the deal. They were not successful – at least not yet. They have also been frustrated that the US has not devoted more of its resources to the Saudi “regime change” project in Syria, seen as a way to reduce Iranian influence in the Middle East. But it is the potential release of the secret 28 pages of the 9/11 Report that purportedly show Saudi government involvement in the attacks on New York and Washington that threatens to really blow up US/Saudi relations. The relatives of the victims are demanding the right to hold the Saudi government legally accountable if it is shown to have had a role in the attacks, and the Senate’s “Justice Against Sponsors of Terrorism Act” would lift Saudi sovereign immunity and allow lawsuits to go forward. The Saudis threaten to dump three-quarters of a trillion dollars in US assets if the bill becomes law – a move that could rock world markets and even the shaky Saudi economy. President Obama’s disastrous visit to the Saudi capital last week may have been seen as the last straw. Billed in Washington as a trip to shore up relations, President Obama got the cold shoulder as the Saudi monarch sent a low-level functionary to meet the US president’s plane while he met an incoming delegation from the Gulf Cooperation Council. The message was pretty clear. I happen to agree with Prince Faisal. We are long overdue for a recalibration of our relationship. While I do not believe we have any business telling the Saudis how to run their country, the decades-long special arrangement must come to an end. No more US-taxpayer subsidized arms deals to a Saudi Arabia that slaughters civilians in Yemen, transfers weapons to ISIS and other Islamist extremists in Syria and elsewhere, beheads its own citizens for minor offenses, finances terrorism overseas, and threatens other countries in the region. It should be known that no longer will the US guarantee the security of the Saudi kingdom. If the Saudis refuse to sell us their oil in protest, there are other producers who would be happy to step in. The Iranians have long been prevented from selling their oil on the world market. If the Saudi government was involved in the 9/11 attacks, it should enjoy no immunity from justice. If that means reciprocal moves from other countries against the harm US foreign policy causes overseas, so be it. Yes, Prince Faisal. By all means let’s “recalibrate” our relationship. No more entangling alliances with Saudi Arabia! Government should be by contract only. The citizen and the state should come to a mutual, official, legal agreement. All adults, upon turning 18 or 21 or so, should sign a formal, written, binding, social compact in which they agree to abide by the constitution and the laws of a given country in exchange for government services. This means in exchange for the defense of their liberty and the protection of their rights. This essentially means the systematic, careful, full-time safeguarding of their person and property by professionally trained and armed government agents or civil servants. The would-be citizen or resident should freely agree to pay a certain fee – say 3% per year of his local income or .5% per year of his local net worth – in trade for expert police and military defense, plus court and jail services, plus the government administration thereof. In theory the contractee of the state might be commanded to surrender some of his rights — such as serving one year of military duty, or a lifetime of no slander or defamation in speech, or being subjected to subpoena coercion at any time. But the potential citizen or resident is always perfectly free to quit, or to refuse to join, such a slightly despotic state. It’s understood that at any time, for any reason, the citizen is free to immediately, unilaterally cancel his contractual agreement by giving brief, official, public or written notice. Thus he renounces his citizenship — and consequent legal obedience and political loyalty — to his former country and government. It’s also understood that the government can strip him of his citizenship or political rights — also by providing official, public notification slightly in advance — for major violations of the constitution or law. In both cases the person involved can either join another government or become a temporarily or permanently stateless person. But no fines, jail terms, or other civil penalties are allowed due to his “treason,” especially not any property or wealth confiscation. If the former citizen owns land, and so chooses, he can theoretically become a one-man country. Or the previously-signed government contract may require him to sell his land for a fair price and then leave. Because the former citizen or resident is no longer bound under political contract to some social group, and thus is no longer paying his service fees or “taxes”, the old government will now stay off his private real estate, and will no longer necessarily protect his person or property from criminals and invaders, i.e. from any attackers or rights-violators. He must defend himself. Moreover the newly independent person can no longer visit his former country without government permission, such as a visa of some kind. When such a person does visit he must temporarily subject himself to the local laws of the foreign government, and perhaps also pay some sort of visitor’s fee. Government by contract ensures that any given state is fully legitimate and proper in that it clearly and openly enjoys 100% of the consent of the governed, from its voluntary members. Convicted criminals may dispute this, but they freely chose to become citizens or residents prior to conviction. Their arrest, trial, and punishment should be entirely open, and a matter of public record, as well as completely based upon the principles of justice and individual rights, and a product of laws that the convicted criminal previously freely agreed to. Any given government should follow the legitimate and proper course of attaining a formal, serious, contractual assent from the totality of its adult citizenry, and all free, sovereign individuals therein. A government not founded on the consent of the governed is a type of criminal syndicate or imposed tyranny which desperately needs to be avoided. On the first Earth Day on April 22, 1970, my high school class traveled to the Mall in D.C. to mark the occasion. Me? I skipped the trip. Instead, I stayed home to watch the crippled Apollo 13 spacecraft return to Earth. My classmates and I had different values. And in the years since, I’ve watched as some of the sub-rosa values of Earth Day have spread to pollute our culture. To get the obvious out of the way, it is valid to be concerned about the measurable adverse effects on human health of raw sewage, or toxic waste dumped into rivers, or poisonous factory fumes pumped out to choking lungs. But that concern has metastasized into a cultural hypochondria, a fear that everything created by humans is dangerous and, worse, is dangerous to an abstraction called “the environment” rather than to humans. What happened? For four and a half decades Earth Day has spread a form of soft indoctrination. Every year, school kids cut out little paper trees and leaves, visit recycling plants, watch Al Gore’s Earth in the Balance, and are generally asked by teachers, “What are you doing to help the environment?” Local news reporters visit the Earth Day Greenpeace booths at the town park and interview local politicos or business folks about how they are conserving the planet. What’s missing from this picture? Humans! Certainly the messages are mixed. Certainly there is talk about our kids living healthier lives if they are not exposed to carcinogens and the like. But the subtle shift fostered by this annual April ritual is from the material world being of value to humans to the material world being of value in and of itself. Forests are of value to humans because we can use their trees for lumber for our houses—good for our material well-being—or walk through them to enjoy their beauty—good for our spiritual well-being. But they are not of value in and of themselves. Yet Earth Day has conditioned two generations to anthropomorphize forests, rivers, oceans, and “the environment” as entities with rights apart from us, the conscious valuers. And these two generations are now susceptible to the appeals of the environmental extremists who argue, in essence, that humans are trespassers on the planet. Thus, we see arguments for public policies that would demonstrably harm humans, especially those in less developed countries. Worse, an unthinking regard for the environment blinds many to real future challenges and their only solutions. As poorer countries develop higher living standards, they will not be able to consume resources at the rate Western countries did when they were industrializing. New technologies that allow for more efficient and, as a result, less polluting ways to use resources will be essential. 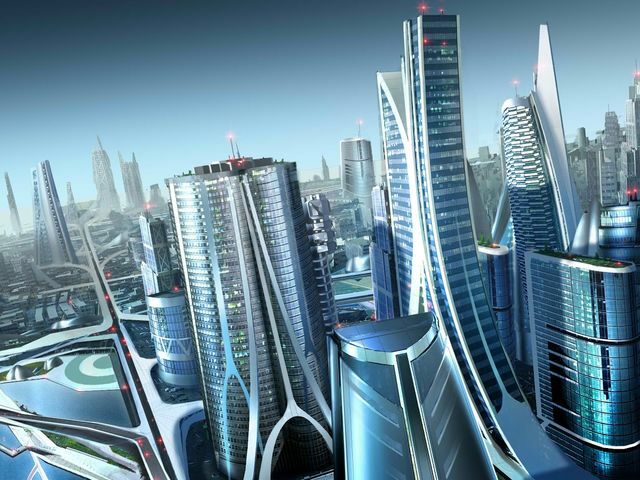 Technology is what created cities, skyscrapers, factories, trains, planes, cars, rockets, and most things that radical environmentalists want to curtail. Technologies are achievements of the human mind that, in turn, empower us to achieve more in our lives and in the world. 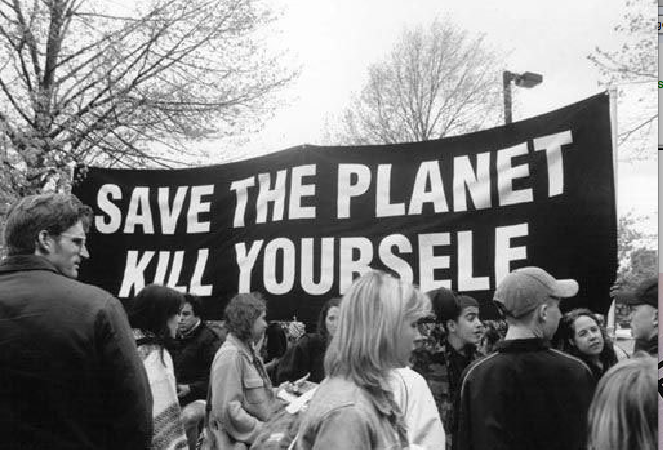 This vision of the future is already grating on those who have been poisoned by the subtle extremist message of Earth Day. But the achievements in recent decades in information technology and the emerging achievements in nanotech, biotech, and artificial intelligence are causing many young people especially to shake off the destructive Earth Day ideology. These individuals understand not only that technology will help us meet true challenges to human well-being. They also appreciate that human well-being is the standard of value. Let’s hope that in the future Earth Day is superseded by Human Achievement Day! The Canadian government is apparently facing growing pressure to graft a Buy Canadian program onto its billions of dollars of planned infrastructure spending. That way, all those taxpayer dollars would help support employment and economic growth here at home instead of shipping it across the border and overseas. Who could object to such a well-meaning policy to prop up good, Canadian jobs? Well, for starters, someone concerned with cost-effectiveness could raise an objection. Such a person might argue that our representatives in government have a responsibility to see that we taxpayers get our money’s worth when they, for example, decide from whom to buy the steel that will be used to build our bridges. Before raising our taxes even higher than they already are, or sinking us further into debt and saddling our kids with the bill, they should try to stretch each tax dollar as far as it’ll go. And if getting the best value for our money means buying steel from China, then that’s what they should do. Someone who understands the general benefits of trade and specialization could also easily object to a Buy Canadian program. When we engage in voluntary exchange with other people, we do so because we expect to benefit—and the people we trade with do the same. By specializing in some form of production, we can get better at it, becoming more skilled and even finding better ways of doing things. Then, through trade, we benefit not only from our own skills and innovations, but from other people’s as well. Importantly, this dynamic holds whether our trading partners are across the street or on the other side of the planet. On the flipside, someone who understands how harmful a trade war is to everyone concerned would have good reason to object to measures like a Buy Canadian program. All parties are losers in a trade war, as protectionist barriers beget more protectionist barriers. It’s like two imbeciles in a gunfight: one shoots himself in the foot, and his rival retaliates by shooting himself in his foot. As our economies limp along with these self-inflicted wounds, we are also in increased danger of seeing our strained relations deteriorate into actual wars, since instead of at least valuing foreigners for what we can get from them through trade, we find it easier to denigrate them as something less than human, the better to justify dropping bombs on them. If this seems farfetched, just think of how certain media outlets portray the people who are currently having bombs dropped on them. And speaking of foreigners, someone whose concern for the well-being of his or her fellow humans doesn’t stop at an imaginary line on a map could also find a Buy Canadian program objectionable. It’s true that some people’s lives here at home are disrupted when businesses close, or when certain kinds of jobs disappear altogether from the local landscape. But the people we trade with in other countries? They’re people too, and trade benefits them just as it benefits someone in this country. Why their well-being should matter less to me because they live in a different country, I’ve never understood. If we want to lend a hand to our neighbours who lose their jobs, we can help them transition to some other kind of work. But “we” shouldn’t keep making steel if “we” can’t make it at a competitive price anymore; instead, we should switch to doing something else, and buy our steel from people willing and able to produce it and sell it at a lower price. They in turn will buy from us the things that we are comparatively good at. And if other governments want to subsidize their steel industries—and therefore our purchases of steel—then our own governments shouldn’t compound the mistake by following suit. Think about it: If it makes sense to Buy Canadian, then why not Buy Quebecois? Buy Montreal? Buy Mile-End? Buy Fairmount-between-St-Laurent-and-Clark? The simple fact is that global trade has made the globe richer, helping to bring us closer than we’ve ever been to eradicating extreme poverty, and allowing everyone not living under the boot heel of authoritarianism the opportunity to live a decent life. Parochialism will only make us poorer and less connected with other people around the world. Instead of Buy Canadian or Buy American programs, what we really need is a Buy Human policy, trading with whichever of our fellow human beings are offering us the best value for our money in their efforts to improve their own lives. Bradley Doucet is a writer living in Montreal. He has studied philosophy and economics, and is currently completing a novel on the pursuit of happiness. He also is QL’s English Editor. Donald Trump recently said he’s a fan of Ayn Rand’s novel The Fountainhead. Even if you haven’t read it, a reflection on the key characters in that excellent work will help you understand much of what’s wrong with The Donald. Not wishing to write a book-length treatment on the subject, I’ll focus on just one thing that’s relevant to the presidential election: how one treats others. In an interview with Kristen Powers, Trump said of The Fountainhead, “It relates to business … beauty … life and inner emotions. That book relates to … everything.” (Here he’s right!) He identified with Howard Roark, the novel’s architect hero, loosely based on Frank Lloyd Wright. 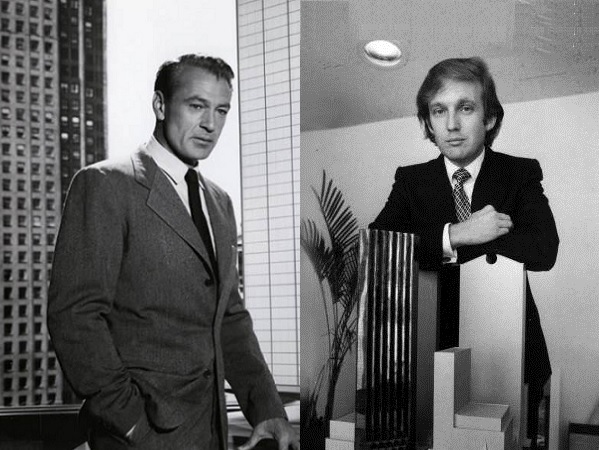 Trump builds buildings too, so no doubt a novel on the subject would interest him. But much of the resemblance between Roark and Trump ends there. Howard Roark loves the creative work of designing buildings for the purpose of seeing them built just the way he designs them. His work is his source of pride. He doesn’t work for the approval of others. Roark must struggle because in his world established architects simply want to imitate the styles of the past, mainly to impress other people who, for the most part, aren’t particularly impressed in any case. Roark must find individuals and enterprises that want his buildings. But he is quite clear that “I don’t build in order to have clients. I have clients in order to build.” He does not bastardize his buildings—sticking columns or balconies on them just to make sales. He has his standards. 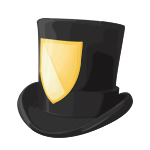 He is honest with his prospective clients and tries to educate them. He respects them enough to treat them like intelligent individuals. If they can’t accept his style, that is unfortunate, but Roark will not pander. Roark has integrity. Another major character in the novel is Gail Wynand, who rose from nothing to build a chain of “Banner” newspapers. Wynand is good at what he does but what he does is not good. He builds his empire by appealing to the lowest common denominator among his readers. He is a yellow journalist who feeds them scandal, sensation, and schlock. He sees his readers as basically stupid and irrational, and his idea of success is not to appeal to the best within them but, rather, the worst, assuming they deserve nothing better. And that is how Trump approaches prospective voters in his political campaign. It’s all a sensationalist, headline-grabbing show. It’s saying the most outrageous things to appeal to emotions on the assumption that his audience can’t or doesn’t want to actually think. But there is a major difference between Wynand and Trump. Wynand wants power over others but his sense of self-worth is not dependent on the adulation of the mob he wants to rule. Trump, on the other hand, seems to drink up the applause of his audience, and if someone challenges him, it’s personal and rates the response of the most insecure playground bully. By contrast, in The Fountainhead, when the novel’s most malicious villain who has tried to block Roark’s career approaches him and asks “What do you think of me?” Roark responds, “But I don’t think of you.” That’s true self-esteem! Which approach works better: Roark’s career built on dealing with people based on reason, or Wynand’s career built on treating people like idiots? Read The Fountainhead to discover the intriguing answer you probably already suspect. In terms of Trump’s political career, it will depend on how many voters prefer to be treated like idiots rather than with respect. Thus the real reason for all these secret meetings could be a panic that the Fed’s eight-year explosion of money creation has not just failed to revive the economy, but is about to cause another major market meltdown. If we are successful, we may be able to force Congress to properly manage the transition by cutting spending in all areas and auditing, then ending, the Federal Reserve. We may also be able to ensure the current crisis ends not just the Fed but the entire welfare-warfare state. As a proponent of attaining indefinite human longevity through the progress of medical science and technology, I am frequently asked to address key questions about the effects that indefinite life extension would have on human incentives, behaviors, and societies. Here, I offer my outlook on what some of these impacts would be. What would be the benefits of life extension? (1) The greatest benefit of life extension is the continued existence of the individual who remains alive. Each individual – apart from the worst criminals – has incalculable moral value and is a universe of ideas, experiences, emotions, and memories. When a person dies, that entire universe is extinguished, and, to the person who dies, everything is lost and not even a memory remains. It is as if the individual never existed at all. This is the greatest possible loss and should be averted if at all possible. The rest of us, of course, also lose the possible benefits and opportunities of interacting with that individual. (2) People would be able to accomplish far more with longer lifespans. They could pursue multiple careers and multi-year personal projects and could reliably accumulate enough resources to sustainably enjoy life. They could develop their intellectual, physical, and relational capabilities to the fullest. Furthermore, they would exhibit longer-term orientations, since they could expect to remain to live with the consequences of decisions many decades and centuries from now. I expect that a world of longer-lived individuals would involve far less pollution, corruption, fraud, hierarchical oppression, destruction of other species, and short-term exploitation of other humans. Prudence, foresight, and pursuit of respectful, symbiotic interactions would prevail. People would tend to live in more reflective, measured, and temperate ways instead of seeking to haphazardly cram enjoyment and activity into the tiny slivers of life they have now. At the same time, they would also be more open to experimentation with new projects and ideas, since they would have more time to devote to such exploratory behaviors. (3) Upon becoming adults, people would no longer live life in strict stages, and the normative societal expectations of “what one should do with one’s life” at a particular stage would relax considerably. If a person at age 80 is biologically indistinguishable from a person at age 20, the strict generational divides of today would dissipate, allowing a much greater diversity of human interactions. People will tend to become more tolerant and cosmopolitan, having more time to explore other ways of living and to understand those who are different from them. (4) Technological, scientific, and economic progress would accelerate rapidly, because precious intellectual capital would not be lost to the ravages of death and disease. Longer-lived humans would be more likely to invest in projects that would materialize over the course of decades, including space travel and colonization, geo-engineering and terraforming, prevention of asteroid impacts and other natural disasters, safe nuclear disarmament and disposal of nuclear waste, and long-term preservation of the human species. The focus of most intelligent people would shift from meeting quarterly or annual business earnings goals and toward time- and resource-intensive projects that could avert existential dangers to humankind and also expand humanity’s reach, knowledge, and benevolence. The achievement of significant life extension would inspire many intelligent people to try to solve other age-old problems instead of resigning to the perception of their inevitability. (5) Major savings to health-care systems, both private and governmental, would result if the largest expenses – which occur in the last years of life today, in the attempt to fight a losing battle against the diseases of old age – are replaced by periodic and relatively inexpensive rejuvenation and maintenance treatments to forestall the advent of biological senescence altogether. Health care could truly become about the pursuit of sustainable good health instead of a last-ditch effort against the onslaught of diseases that accompanies old age today. Furthermore, the strain on public pensions would be alleviated as advanced age would cease to be a barrier to work. What drawbacks would life extension pose? I do not see true drawbacks to life extension. Certainly, the world and all human societies would change significantly, and there would be some upheaval as old business models and ways of living are replaced by new ones. However, this has happened with every major technological advance in history, and in the end the benefits far outweigh any transitional costs. For the people who remain alive, the avoidance of the greatest loss of all will be well worth it, and the human capacity for adaptation and growth in the face of new circumstances is and has always been remarkable. Furthermore, the continued presence of individuals from older generations would render this transition far more humane than any other throughout history. After all, entire generations would no longer be swept away by the ravages of time. They could persist and preserve their knowledge and experience as anchors during times of change. Every day, approximately 150,000 people die, and approximately 100,000 of them die from causes related to senescence. If those deaths can be averted and the advent of indefinite life extension accelerated by even a few days, hundreds of thousands of irreplaceable individual universes would be preserved. This is worth paying even substantial costs in my view, but, fortunately, I think the other – economic and societal – effects that accompany life extension would be overwhelmingly positive as well. As Death is Wrong, my illustrated children’s book on the prospects for life extension, points out, “Death is the enemy of us all, to be fought with medicine, science, and technology.” The book discusses the benefits of life extension in a language and format accessible to most children of ages 8 or older. 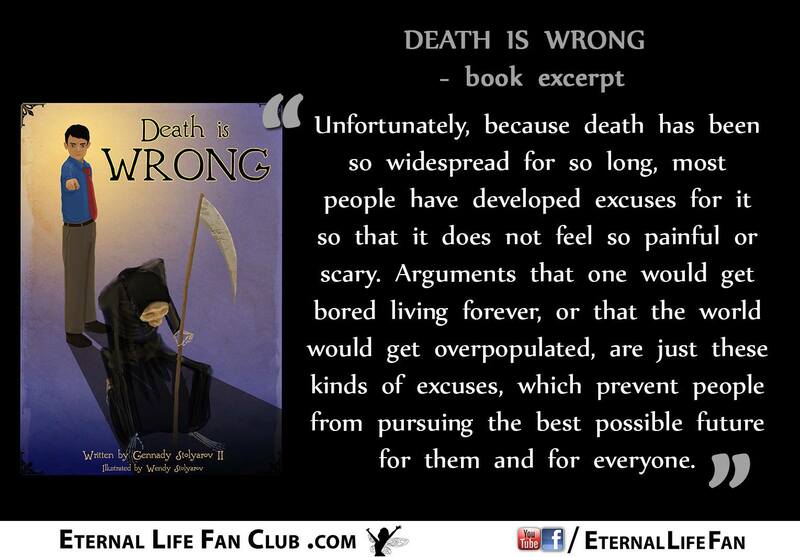 Death is Wrong also outlines some common arguments against life extension and reasonable responses to them. For instance, I respond to the common overpopulation argument as follows: “human population is the highest it has ever been, and most people live far longer, healthier, more prosperous lives than their ancestors did when the Earth’s population was hundreds of times smaller. Technology gives us far more food, energy, and living space than our ancestors had, and the growth in population only gives us more smart people who can create even more technologies to benefit us all. Besides, humans ought to build more settlements on land, on water, underwater, and in space. Space travel could also save the human species if the Earth were hit by a massive asteroid that could wipe out complex life. ” I respond to the boredom argument by stating that, due to human creativity and discovery, the number of possible pursuits increases far faster than the ability of any individual to pursue them. For instance, thousands more books are published every day than a single person could possibly read. Would governments ban indefinite life extension if it is achieved? Once life-extending treatments are developed and publicly available, national governments would not be effectively able to ban them, since there will not be a single medicine or procedure that would accomplish indefinite lifespans. Rather, indefinite life extension would be achieved through a combination of treatments, beating back today’s deadliest diseases using techniques that would not be limited in their application to people who explicitly want to live longer. (For instance, people who do not harbor that particular desire but do want to get rid of cancer, heart disease, or Alzheimer’s disease that may afflict them or their loved ones, would also benefit from the same treatments.) These treatments would be as embedded in the healthcare systems of the future as over-the-counter drugs like aspirin and ibuprofen are today; it would be practically impossible to ban them, and countries that did would face massive black markets or people traveling abroad to receive the same treatments. Furthermore, genuine healthy life extension could be a great fiscal solution for many welfare states today, which are finding themselves with unsustainable burdens pertaining to old-age healthcare and pensions. The majority of health-care costs are expended to keep frail people alive a little bit longer and to fight an expensive and ultimately losing battle against the diseases of old age. The only way dramatic life extension could occur is if regular and relatively inexpensive maintenance (made inexpensive through the exponential progress of information technologies and bio/nanotechnology) prevented the decline of the body to such a stage where expensive, losing battles needed to be fought at all. Replacing the current extremely expensive end-of-life medical care with periodic rejuvenation and maintenance would be a great cost-saver and may avert a major fiscal crisis. What concerns me is not governments banning life-extension technologies once they are developed, but rather existing political systems (and their associated politically connected established private institutions) creating barriers to the emergence of those technologies in the first place. Most of those barriers are probably inadvertent – for instance, the FDA’s approval process in the United States premised on a model of medicines and treatments that must focus on single diseases rather than the biological aging process as a whole. However, there have been influential “bioethicists”, such as Leon Kass, Daniel Callahan, and Sherwin Nuland, who have explicitly and extensively spoken and written against healthy life extension. It is important to win the contest of ideas so that public opinion does not give encouragement to the “bioconservative” bioethicists who want to use the political process to perpetuate the old cycle of life, death, and decay – where each generation must be swept away by the ravages of senescence. We must stand for life and against age-old rationalizations of our own demise. I am seeing more and more articles, even at respectable outlets such as the Economist and the Financial Times, suggesting that the rise of right-wing and left-wing populism shows that something is wrong with the neoliberal model. Nothing could be further from the truth. The past two decades have been by far the best two decades in human history, and that’s what really matters. Naysayers will sometimes acknowledge that hundreds of millions of people have recently risen out of poverty, but then claim that living standards have stagnated in America. That’s also nonsense, as I explained in this post. The next fallback position is that while real incomes in America have risen, the gains have gone to corporations, not workers. That’s also nonsense, as I explained in this post. The share of national income going to workers today is the same as it was 50 years ago, the supposed heyday of the working class. The next fallback position is that while wages have done fine, even in real terms, wage income is becoming less equal. Bingo! Finally we get to an accurate statement. Fifty years ago, blue-collar workers at General Motors often made more than college professors. People with short attention spans sometimes act like this period was “normal”, ignoring 10,000 years of human history. They seem to suggest that our most pressing problem is that young men who don’t study in school and just shoot rubber bands across the classroom should be able to earn an income that (in relative terms) was never possible in any period of world history before the 1950s and has never been possible in any period of world history after the 1970s. It reminds me of when farmers used to set the “parity” of farm prices with other goods prices based on the relatively high levels of 1909-14, treating that ratio as normal for purposes of farm subsidies. Don’t get me wrong: I have nothing against blue-collar workers. I’m relatively intellectual, and even I found the public schools to be mind-numbingly boring. I could hardly stay awake. I can’t even imagine how students less interested in ideas than I am could’ve gotten through the day. Nor am I one of those conservatives that will trash low-income whites for their lifestyle choices. As far as blue-collar workers are concerned, I wish them well. But I wish everyone well (except Trump), and the unfortunate truth is that the set of economic policies that is best for the world right now is probably not optimal for a subset of American blue-collar workers. When I point out that the most important factor in trade policy is the impact on the poor in developing countries, some of my commenters tell me that the US shouldn’t have to import from China or India because they have lots of other countries to sell to. As Marie Antoinette might’ve said “let them sell to Canada.” That’s right, progressives ease their conscience by claiming that other developed countries won’t follow the same evil trade policies that progressives like Sanders want the US to follow, so things won’t actually be that bad for poor people in Bangladesh. More often, they entirely ignore the issue. I know that progressives like to think of themselves as the good guys, but the honest truth is that on trade they are increasingly becoming the bad ones, right along with Trump. And here’s what else people don’t get. Not all the problems in the world are caused by neoliberal economic theories, for the simple reason that not all economic policies reflect neoliberal economic theories. Even if everything people say about inequality is true, there’s nothing wrong with the neoliberal model, which allows for the EITC, progressive consumption taxes, and sensible reforms of intellectual property rights, occupational licensing, and zoning laws. I can’t help it if Democratic politicians oppose reforms of intellectual property rights. I can’t help it if progressives that once favored progressive consumption taxes now oppose progressive consumption taxes. I can’t help it if Democrats voted to repeal the luxury tax on yachts soon after having enacted a luxury tax on yachts. I can’t help it if progressives suddenly feel that a $15 an hour minimum wage is not a loony idea. The simple truth is that neoliberal economic policies work, as we’ve seen in Denmark and Switzerland and Singapore, and socialism doesn’t work, as we’ve seen in Venezuela. So I’m asking all those wavering neoliberals in the respectable press (Thatcher called them “wets“) to stop your handwringing and get out there and boldly defend the neoliberal model. It’s not just the best model; in the long run it’s the only model that really works. Scott B. Sumner is the director of the Program on Monetary Policy at the Mercatus Center and a professor at Bentley University. He blogs at the Money Illusion and Econlog.